Learn how to cook delicious recipes in a wok. The Wok is a kind of pan used above all in the south-east asian stir-fry foods using a constant movement. It is ideal for preparing vegetables al dente, chicken with vegetables or any type of recipe with vegetables and meat. Is a healthy way to cook food because it uses very little oil, because it does not fry the ingredients, but that are skipped. You will find recipes of rice, vegetables, chicken, mushrooms and many ingredients more. 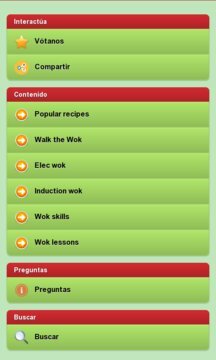 We also have a section on how to cook with a wok in different types of kitchens, including electric and induction. Learn the secrets, tricks and listen to our advice and become a chef first.